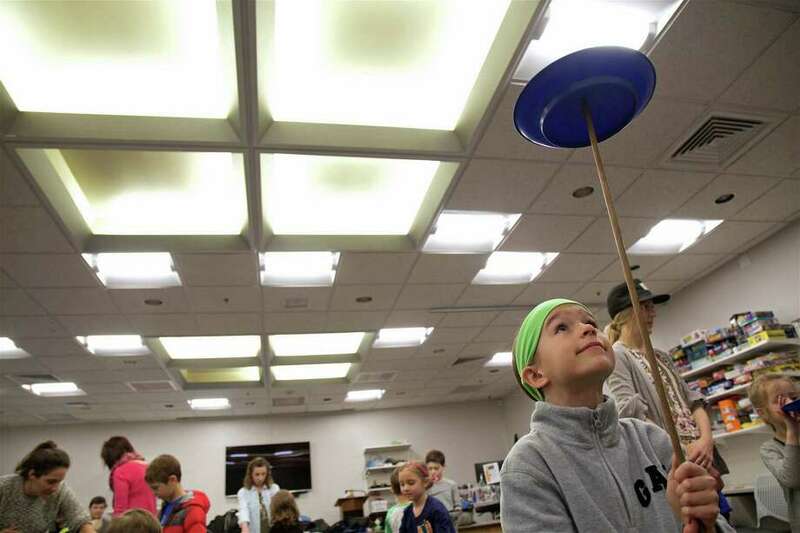 Juliet Olmstead, 8, of Fairfield, gets her plate moving at the circus arts demonstration at the Fairfield Woods Branch Library on Saturday, March 23, 2019, in Fairfield, Conn.
FAIRFIELD — It wasn’t a typical big top, but it was all the excitement of a circus school. The Fairfield Woods Branch Library hosted a visit from Heidi Kirchofer from the Harwinton-based group Matica Arts on Saturday morning, featuring demonstrations and instructions on a range of circus arts, including juggling, plate spinning, baton bouncing and more. “I’m going to show them what’s possible and they’re going to get to try everything out,” said Kirchofer, who began her journey as an artistic acrobat and performer years ago when she was traveling in Central America and began learning her craft from veteran street performers. More than 30 kids took part in the class. Kirchofer, who also teaches, performs at festivals and events throughout the Northeast along with her partner, Joel Melendez.